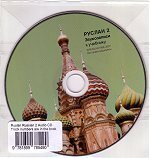 This is the Audio CD to accompany the Ruslan 2 Student Book. Quality recordings with more than 10 different voices. 90 tracks, including all the dialogues, reading passages, songs and poems for learners.